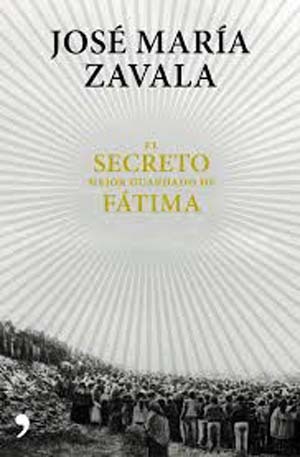 Our Third Secret was Written by Sr. Lucy, Handwriting Expert Affirms by Marian T. Horvat, Ph.D.
TIA has received news from several readers about a recently published book by José María Zavala titled El Sécreto Mejor Guardado de Fátima (The Best Kept Secret of Fatima). Since it was reported to have news about the Third Secret TIA published seven years ago on this site, I purchased the electronic version in Spanish and read it. Most of the book rambles about, repeating the Socci theory of a supposed “4th Secret” (never very convincing to me) and the quite credible theme Fatima readers are familiar with: The bogus Third Secret with "a bishop in white" that Cardinals Sodano and Ratzinger released in 2000 was to hide the real Secret and, as then-Card. 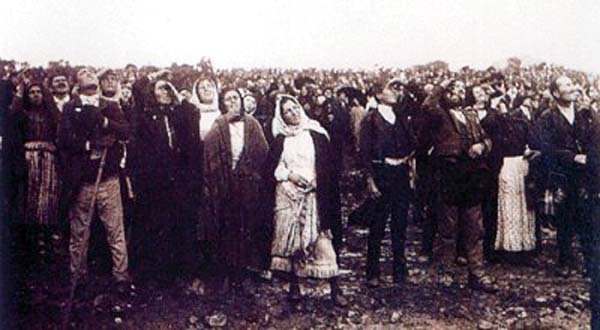 Ratzinger firmly stated, to close the history of the Fatima revelations and end any further speculations. But the speculations continued. Many Fatima experts and devotees – like us – have refused to accept this farce. Why? Because the Vatican-revealed secret included nothing about an apostasy in the Church that was reported by credible sources to be in the message: e.g. Cardinal Oddi, who said it regards “a revolution in the Church;” Cardinal Ciappi, who said it spoke of an apostasy that begins "at the top," JPII, who stated in Fulda in 1980 that it involved a catastrophe where millions would die, Fr. Malachi Martin, who said it was something that would frighten people and fill the confessionals, and even Card. Ratzinger, who in 1984 affirmed the secret was a prophecy and spoke of the dangers threatening the faith. Further, the lengthy story released by Sodano and Ratzinger contradicts the words of Cardinal Ottaviani, Bishop Venancio, Canon Barthas and others who clearly stated that the Third Secret was written by Sr. Lucy on a single piece of paper, with about 25 lines of text. Finally, the Vatican-released Secret had nothing to do with Portugal conserving the dogma of the faith, the final words of the Second Secret, to which Sister Lucy added "etc.," indicating more words of Our Lady about Portugal would follow in the Third Secret. 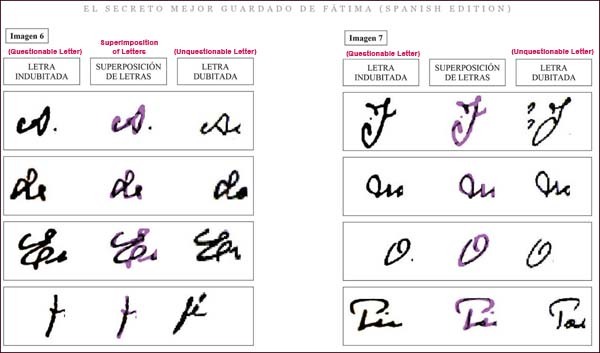 The new data of significance in Zavala's book is an analysis by a well-known and highly regarded Spanish graphologist – handwriting analyst – Begoña Slocker de Arce (here), whose long list of credentials are impressive. She compared the possible undisclosed one-page Third Secret – published by Tradition in Action on our Fatima Issues page on April 27, 2010 – with Sister Lucy's handwritten First and Second Secrets (written by her definitively on August 31, 1941). After a detailed analysis and study of the two handwritings, the expert concluded in her report that "the 3rd document" – the Secret TIA published – had been drafted "by the same hand" as the first two documents known to be definitively written by Sr. Lucy of Fatima. Just as each one has a particular way of walking, gesturing, laughing, walking, etc. so also the handwriting has a peculiar series of tendencies and features that differentiate it from others, Begoña Slocker explains. Writings can vary in many ways throughout one's life, she tells us, but there are innate "type gestures," intrinsic peculiarities and graphic personalizations that do not change over time. And these characteristics give the author unique marks that can always identify him. For example, in the superimpositions of letters she made below from the questionable Third Secret Letter and the unquestionable letters written by Sr. Lucy in the First and Second secrets, she found small differences of vibration natural to spontaneous writing. Nonetheless, the linked letters characteristics, hand raises for punctuation, t-bars and other features distinguishable to the trained eye clearly demonstrate, in her view, a single, unique style. 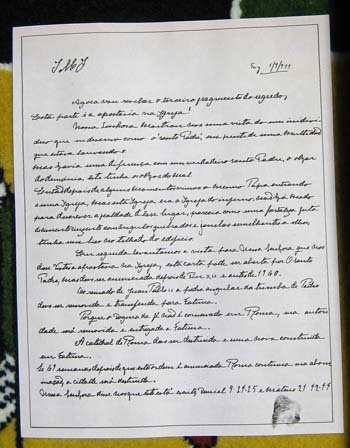 "In view of the above findings, it can be determined that, after a thorough analysis, there are qualitative and quantitative elements that the document in question, referred to here as the Unrevealed Third Part of the Secret of Fatima, was made by the same hand as that of the unquestioned documents corresponding to the First and Second Parts of the Secret of Fatima, written in fact by Sr. Lucia dos Santo in her Third Memoir of August 31, 1941. "This opinion has been made as objectively as possible, taking into consideration both what can favor and cause injury to any parties involved and with my full realization of the penal sanctions that could be incurred if I disregard my duty as an expert. "[Signed] Begoña Slocker de Arce"
This evidence of a respected graphologist should raise new interest in the possible Third Secret posted on our website seven years ago. I recall very well when TIA first received the anonymous e-mail from a reader in Portugal. I sent it on to our website editor Atila Guimarães, who is always very suspicious, expecting him to reject it. To my surprise, he expressed keen interest in it. In his opinion, it could very well be the real secret, since there was an appearance of authenticity in it: Its content certainly spoke of a tremendous apostasy inside the Church – in fact this is the opening statement. Its simplicity of form corresponded to that of the other two messages of Our Lady to three peasant children. The size of the document also matches perfectly - 25 lines, the thumbprint adding a note of authenticity. Then, after some moments we saw the same Pope entering a Church, but this Church was the Church of hell; there is no way to describe the ugliness of that place. It looked like a gray cement fortress with broken angles and windows similar to eyes; in the roof of the building it had a beak. In the kingdom of John Paul II the cornerstone of Peter's grave must be removed and transferred to Fatima. Posting the letter opened a discussion with readers, who jumped in it to give their opinions and pose their doubts (you can read the postings here). All the readers agreed that the one we published was certainly more authentic than the one released by the Vatican in 2000. To the objections, Mr. Guimarães gave responses. Many of these questions are addressed by Mr. Zavala, often with arguments quite similar to the ones we posted (he does not quote his sources, I noted with disappointment). 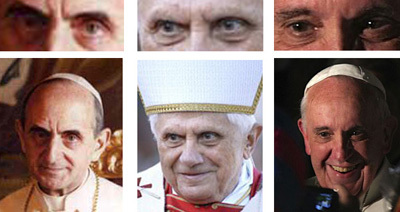 TIA also posted a photo-collage of the evil gaze of then-pontiff Benedict XVI. It would not be difficult to make an equally horrid photomontage of Francis' gaze (see here for gazes of Paul VI, Benedict and Francis, among others). We also showed pictures of Novus Ordo churches that match the description of the 'Church of hell' reported in the letter, and confirmed that John Paul II had indeed placed the mentioned cornerstone at the new Church at Fatima. Mr. Guimarães even extensively addressed the question of possible falsified data in the letter, which could have been made with the precise intent to discredit its authenticity and, thus, bury the authentic message definitively. But, it appears this funeral has not taken place yet. With this strong new forensic evidence by Begoña Slocker de Arce, who testifies that her conclusion was not influenced by any interested party and stakes her high reputation on the objectivity of the results, it seems that the question should be re-opened. 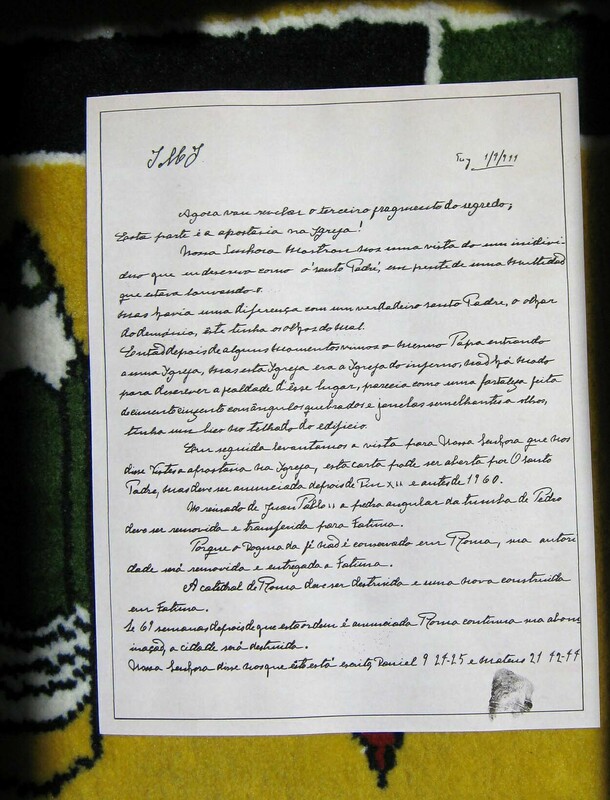 In this 100th anniversary of the apparitions of Fatima, it is both interesting and opportune that an official testimony of the authenticity of the handwriting should come to light. With the recent earthquakes shaking even Rome, one wonders if Our Lady will no longer be able to hold back the hand of her Son, so offended by sins and apostasy, and the Eternal City, which survived many earthly empires, will disappear in a heavenly punishment for the apostasy of the Conciliar Church. And, then, what will come? A new Rome in Fatima? Certainly, it is an interesting hypothesis. This year marks the 100th anniversary of the Miracle of the Sun. The testimony of the authenticity of Sr. Lucy's writing in the posted Third Secret is one surprise. Are there others to come? What Does the ‘Ugly Church’ Mean?